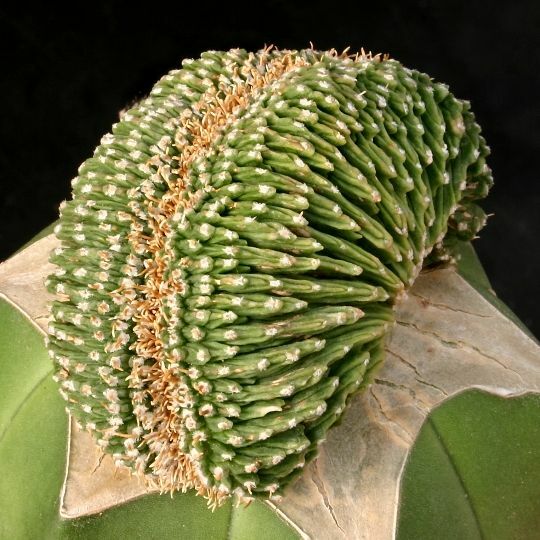 Aztekium ritterii f. cristatum hort. Accepted Scientific Name: Aztekium ritteri Boed. Aztekium ritterii f. montruosa hort. Aztekium ritterii f. senilis hort. 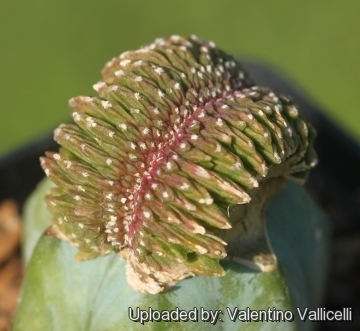 Description: This is the crested form of Aztekium ritterii a very rare and extremely slow growing cactus from Mexico seldom exceeding 5 cm in width with rounded ribs. This is one of the more famous crested cacti sought after by cactus impassioned, but very slow growing and seldom available. Stem: The stem is crossed by numerous horizontal furrows. Between these true ribs are small secondary ribs, reaching about halfway up the plant body. The colour of the younger growth is a rather pale yellowish green or purplish, merging to grey-green on the lower, older growth. 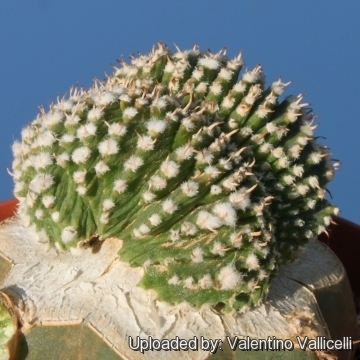 The crested apex of the cactus contains a some white wool. Aztekium ritteri Boed. : Very slow growing cactus, seldom exceeding 5 cm in diameter and rather less in height, with 9 to 11 rounded ribs crossed by numerous horizontal furrows. 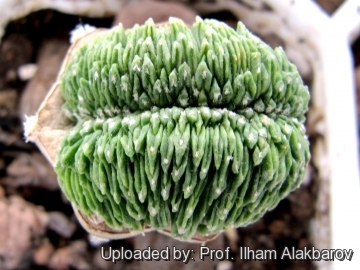 Between these true ribs are small secondary ribs, reaching about halfway up the plant body. Aztekium ritterii f. cristatum hort. : Crested form. Aztekium ritterii f. montruosa hort. : monstrous form. Aztekium ritterii f. senilis hort. : this a woollier form of Aztekium ritterii distinguished by its areoles densely covered by tufts of soft tangled greyish-white hair. Origin: unknown. 4) Fitz Maurice, B & Fitz Maurice, W.A. 2013. Aztekium ritteri. In: IUCN 2013. "IUCN Red List of Threatened Species." Version 2013.2. <www.iucnredlist.org>. Downloaded on 20 February 2014. Cultivation and Propagation: It is of extreme slow growth - probably the slowest of the entire cactus family. It usually takes several years for growth to be noticeable. Prefer some shading. Reproduction: They are usually grafted, It is also possible to root pieces of crest from grafted plants but with little success.